Well, maybe we can answer this question better in two days time. But why not get the discussion started ? Who should be our arch-rivals for the next season ? I remember earlier in the season, Robin had considered Hyderabad, Mumbai and Bangalore as potential rivals and settled on Bangalore. But now, is it time for a re-think given Bangalore's poor performance ? 2) Delhi Daredevils - We seem to be very evenly matched, plus there is the age-old South v North issue, plus Dhoni also bypassed Sehwag for India captaincy, so there's a contest. 3) Mumbai Indians - The Mumbai crowds are the worst behaved. How can we forget the way they booed Dhoni at the Wankhede ? Plus they fairly destroyed us in our away game. Plus there is the history and the financial clout of Mumbai. Of course the earlier reasons mentioned by Robin are still somewhat relevant. I don't want to make this sound a Dhoni v Yuvraj or Dhoni v Sehwag thing ... that's just one thought for you guys to consider. Waiting to hear from you as to who should be our arch-rivals for next season and why ? So Stephen Fleming will not be available for the rest of the tournament leaving due to personal reasons (birth of his child) as per reports. This will be a bit of a blow - losing our accomplished, experienced opening batsman on the eve of the semifinals. At the same time he hadn't really set the world on fire as yet but I for one was banking on him to come good. So what are our options now ? Do we go for a replacement foreign player as we can ? However I do think it will be too much to get a newcomer in at this late stage and ask him to gel with the team. We have the option of going in with either Vidyut or Aniruddh of course, but I for one would be interested in Chamara Kapugedara. I know he didn't quite impress in whatever chances he got but I have seen him play for Sri Lanka and when he gets going, he can be a class player. What are your thoughts ? How do we go about this problem ? How do we replace Fleming ? Looking forward to hearing from you guys. When both these teams met last time, Chennai Super Kings plucked a victory from the jaws of defeat. Bangalore Royal Challengers would be still ruing over that close match. Both the team's fortunes has not changed much after that. While Chennai Super Kings has been able to hold on to its top four position, Bangalore Royal Challengers are ailing at the bottom of the table. With regard to today's match, Bangalore Royal Challengers has nothing to lose, which makes them a very dangerous side. So we can surely see a spirited opposition from Bangalore Royal Challengers. The good thing is that most of the players(both international and local) are in good form. But still, the team may experiment with some new players. Steyn: Last time when both the teams met, Steyn was clobbered by Dhoni in his final two overs. He would be looking for revenge, making him a very dangerous bowler. Misbah-ul-Haq: He finally found form in his last game. If Bangalore Royal Challenges bat second, he could be their key player. Dhoni Vs Steyn: Steyn would be looking for revenge against Dhoni & Co. So this battle could be interesting. Dhoni Vs Kumble: In IPL, Dhoni has found it tough to handle leg spinners. So it would be key to watch how Kumble bowls to Dhoni. Favourites: Home crowd advantage makes Chennai Super Kings the favourite. But expect another tightly fought game. Manpreet Gony has impressed one and all by his performance at Indian Premier League. For a novice bowler, who hardly had any first class experience, he has lead the CSK bowling attack with aplomb. Not only that, he has also won a match for Chennai Super Kings with his bat. A man, with a big heart and a great attitude, he surely has a great future before him. Times of India in its article - aptly titled - "The ecstasy and Agony of being MS Gony", reveals his personal side that you will never hear from him again. "As he stood alone in a Delhi hospital, clutching the lifeless body of his baby, the light seemed to have gone out of his life." "When a father holds the dead body of his son, the other things in life become insignificant. I was selected to represent PCA in the Buchi Babu meet within seven days of this tragedy. I went as it was my maiden call-up, leaving my wife behind"
"I was frustrated as I was taking wickets in club cricket consistently but was not being considered for selection. I was thinking about leaving but my wife insisted that I should just carry on. Those were hard days"
"I still don't have a job. I used to earn peanuts playing club cricket. My wife sustained the family"
"I snapped all ties with my parents as they were never nice to my wife"
"I want my wife to take the Civil Services entrance test"
P.S: On reading the personal experiences of players like this, I thanked Modi & Co. for coming up with this concept. And Thank you, Manpreet Gaur for standing-by Gony during those dark days... Was reminded of the old quote "Behind every successful man, there is a woman". How true! Some of you would have already bought the official Chennai Super Kings album marketed by Big Music. If not, you could download them here. The long term success of a professional club is hugely dependent on the way the club acquires and nurtures young talent. But in our team, most of the international stars are in their thirties and could not be expected to play for more than 5 years. So it is time, our team starts acquiring young players especially bowlers to strengthen the bench and lay a foundation for a strong future team. One of the players that I wanted to see on the yellow clothes was Ajantha Mendis, the young Sri Lankan mystery leg spinner. He could have easily become the future replacement for Muralitharan in Chennai Super Kings team. But Cricinfo reports that he has been poached by Kolkata Knight Riders. Similarly, one of the franchises is close to sign a record deal with Pietersen for the next three years. Hope there is some one in Chennai Super Kings who scouts for young talent (both Indian and foreign) and bring them into the team in a earlier stage so they develop a sense of association with the franchise. Who are the players (not yet signed by any franchise) you would like to see on our squad? Cross-posted on The DLF IPL. Bring on Ntini: Our team is one of the poorest bowling sides in the tournament in the tournament[If you want statistics, check here]. In this situation, it does not make sense for preferring Kapugedera(essentially a batsman) to Ntini (a strike bowler). Ntini may not have taken a single wicket in his first three IPL matches. But he is the senior most fast bowler in the team and deserves a place in the playing eleven. Also he and Gony could form a potent pace pair. What are your suggestions for the team? Both Murali and Fleming echoed in their TV interviews that 2 wins will carry Chennai Super Kings team to the semifinals. This belief is held by both the team and its fans. But is it true? It clearly shows that three or four teams would reach the required 16 points and would fight for the final two semifinal spots. This means the net run rate would be the one that decide those spots. And Chennai Super Kings with one of the poorest run rates (as of now) may miss out that spot. So to be sure, it is essential that the team musters 3 wins in the rest of their IPL campaign. If not, they have to depend on Bangalore Royal Challengers and Deccan Chargers to produce a few upsets against the other teams. I have already reported about our team team walking the ramp in News Snippets. Dhoni & Co. walked the ramp when the team sponsor - Peter England hosted a dinner for them. Peter England has now released the official video of the event. As Gaurav has already pointed out, we lost to the better player. But all our losses have this characteristic 'individual brilliance' phenomenon. (Tanvir - Rajasthan Royals, Sehwag - Delhi Dare Devils, Gilchrist - Deccan Chargers and Jayasuria - Mumbai Indians). Hope our bowlers find a way to contain these flashes of individual brilliance. With this loss, Dhoni & Co. are under a lot of pressure since they now need to win at least 3 matches (if they do not want to depend on the performance of other teams to secure their semifinal berth). Badrinath & Dhoni: Badrinath and Dhoni continued their good form from the last match and stitched up a good partnership in the lower middle order that laid the base for the competitive score. This should give confidence to the top order batsmen and let them play much more freely. Ntini Out: Ntini may not have taken a single wicket in his earlier IPL outings. He may have leaked runs. But he is the senior most fast bowler in the team and deserves a place in the squad. Also Ntini gives a few more bowling options for Chennai Super Kings. For example in today's match, Dhoni did not have any other options other than Morkel and Gony during power play, since other slow bowlers could have been easily taken for a ride by the batsmen. Murali & Dhoni: Murali may have been assigned the role of containing runs. But he is our major strike bowler and could change a game on his day. But Dhoni tends to bring Murali pretty late in low scoring games. Dhoni could have at least taken a gamble today by bringing on Murali inside the power play. Fleming & Kapugedera: While Fleming never found his touch in today's match, Kapugedera did not make use of the opportunity given to him. I hope Chennai Super Kings brings in Ntini for Kapugedera since Kapugedera's presence has not made any difference to the team's performance so far. Now we have to wait and see how Chennai Super Kings perform before the packed Eden Gardens stadium. I choose to quote Steve Waugh today for there is nothing else that can describe today's performance. Yes, we struggled with the bat and the ball early but once in a while Jayasuriya can produce an innings of such bloody magnificence that even a total of 300 would appear tiny. I'll leave it to Robin to do the detailed analysis and come up with the important areas that we need to work on as we move into the final stage. Hope that's okay, Robin ? With the drubbing we received today at Mumbai, Chennai Super Kings' Net Run rate has taken a plunge. This means even a two wins out of the four matches may not be enough for the team to secure its semifinal spot. So a little bit pressure on Dhoni and let us see how the team responds to this pressure. How do you rate Chennai Super Kings' chances of reaching the semifinals? A resurgent Mumbai Indians team, strengthened further by the return of its batting Maestro Sachin Tendulkar, would be taking on Chennai Super Kings. While Chennai Super Kings are sitting pretty in the points table with 6 wins, Mumbai Indians have to win at least 5 of the 7 matches to reach the semifinals. So we can expect a highly contested match between the determined Mumbai Indians Vs Cool Chennai Super Kings. While the win against Delhi Daredevils was set up by our batsmen, the last match was won by our bowlers. In addition to Balaji's bowling, it was heartening to see the way both Morkel & Murali bowled. While Murali did the task he was asked to do (control runs), 19th over bowled by Morkel (especially his yorkers) set up the win. [As the tournament progresses, expect Morkel's bowling to become crucial to the team rather than his batting] It was also heartening to see Badrinath making use of the opportunity provided to him. Mumbai Indians team possess a host of explosive hitters who could change the match on their day. But all their wins so far has been set up by their bowlers. So Chennai batsmen better watch out for them. Sachin Tendulkar: Any Doubts???. The master blaster returning from the injury would be determined to make sure that his team starts the second round of IPL with a win. Home Crowd: Even during the continuous losses of Mumbai Indians, the home crowd was firmly behind their team. So we can expect them to create that 'extra' support for Mumbai Indians and that 'extra' pressure on Chennai Super Kings. Tendulkar Vs Gony: One Player has loads of experience and is admired all over the world and the other player is one of the finds of the tournament. I am sure this contest would decide the match. Captain Tendulkar Vs Captain Dhoni: It was on Tendulkar's suggestion that Dhoni was made the captain of T20 side. It would be a keen contest to watch which captain has the final laugh. Welcome to Chennai Super Kings fans and supporters who may have found this blog through Web Search or other links. Firstly, My name is Robin Samuel and my love relationship with Chennai Super Kings started from day one. I blog both here at Fan Site of Chennai Super Kings and also at India Centricity. Fan Site of Chennai Super Kings is a blog that is devoted to its support for Chennai Super Kings in the blogging world and also promises to be the one-stop for all news, match previews, analysis regarding Chennai Super Kings. Incidentally Fan Site of Chennai Super Kings is the first fan blog that sprang up to support Chennai Super Kings, the Chennai franchise of Indian Premier League. You may want to check out the Chennai Super Kings' Fixtures and Squad for this year's Indian Premier League. Thanks for stopping by - I hope you enjoy your stay at Fan Site of Chennai Super Kings. If you do have any questions feel free to drop me a note in a comment below. Cross-posted on The DLF Indian Premier League. Woohooo !! What a game that was last night ! One of the best in the IPL so far, if not as close as some of the others ! I was there once again right in the thick of the action ! The last couple of games had been a bit low-key what with them being scheduled on weekdays and Chennai losing out. But on Saturday night, the Chidambaram Stadium was once again packed to the rafters - for the first time since .. ummm .. the Kolkata game yeah ! And Dhoni and his boys did not disappoint. It is hard for me to pinpoint what was the highlight of the the night ! Was it the sight of the world's best bowler, Muralitharan and the best batsman Sangakkara, donning opposite colors, meeting at the center of the ground before the game ? Was it Preity Zinta arriving at the stadium from the gate right next to the stand where I was sitting and then moving along the boundary ? Was it Badrinath smashing the ball and in particular being the first batsman in the IPL (need to check this) to maximize the free hit ? Or was it Dhoni's two big hits each of which landed a few feet either side of me ? Or those by Marsh that cleared the ground with so much ease ? Finally, was it that fantastic spell by the folk-hero Laxmipathy Balaji ? The King's X1 were easily one of the more sporting teams to have arrived in Chennai - particularly the Sri Lankans in the squad. That meeting between Sangakarra and Murali was quite clearly a photo moment (as was Preity's entry later, Preity actually looks prettier in person than on camera, a rare phenomenon) - of course I could capture neither due to my lack of possession of a decent camera-phone. Later, during the game I could see Jayawardene helping out Chawla, patting him on the back and giving him tips when he was being hammered. Badrinath's batting was superb. For long I wanted to see this guy in action having heard raving reviews about him from Tamil Nadu cricket followers. Dhoni really took to Chawla but preferred to play out his other team-mates, Irfan and Sreesanth, both of whom bowled really well I thought. At one point when Sreesanth bowled Dhoni a bouncer, Yuvraj came up and had some words - I don't know what he said, but clearly Yuvi was in quite a foul mood today and that was not elevated when he flopped royally when batting. 180 was a fair score, though by no means a massive one. But we got behind the home team from ball one when they were in the field and made such a noise that the pressure was huge on the visitors. The fielding at the start was quite brilliant, especially with Murali hitting the stumps with great regularity. And on a couple of occasions when some of the fielders were sloppy, Dhoni really let go at them and asked them to focus. Well, Shaun Marsh did hit some towering sixes right out off the ground, but once Balaji got himself into the act there was only really going to be one winner. Balaji may have only briefly shone on the cricket field, but already he is a mini-legend. Not entirely for his cricketing skills, which incidentally, are substantial, but also for his massive, easy almost casual smile and his long locks of hair. Just ask the Pakistani girls who saw him in 2004. The Balaji of today is much slower in pace, than in his heyday and with a remodeled action, yet the skill is still there. Last night he got surprising bounce that none of the other bowlers on show could manage and first destroyed the threatening partnership of Sarwan and Marsh. And finally when his good friend Irfan was looking like spoiling the party for Chennai he came up with that unbelievable sensational hat-trick which will not merely go down in history books, but also in the folklore of Chennai cricket for generations to come. Once again, a close game with a local hero coming up trumps in the final act with the whole stadium cheering form. The best formula for an IPL game, in my opinion. With Badrinath and Balaji being the main protagonists in this act, the Super Kings look serious title contenders once more and this time based on local talent than imported. Two Kings in Indian Premier League are going to meet for the second time tomorrow. While Punjab Kings are on a great winning roll, Chennai Super Kings rediscovered their winning streak in the last match. I am sure Punjab Kings' bowlers will remember the thrashing they got from Hussey & Co. So they will be aching to settle the scores this time around. Even Chennai Super Kings' bowlers would be looking forward to provide a good performance for their side, after their poor outing against Delhi Daredevils. Tomorrow is going to be the final of the five back-to-back matches of Chennai Super Kings. So you can expect our team to be little tired and jaded on the field after having crisscrossed the country for the matches. Batsmen would be on a high after their good performance. You can expect them to continue their good form. Dhoni would also be under pressure to prove that the victory against Delhi Daredevils was not a one-time fluke. With their five continuous wins, we can expect the current table toppers Punjab XI Kings coming here with a lot of confidence. Sreesanth has been bowling with a lot of vigour after the slap gate controversy. So he would be looking forward to this match. If the pitch provides any assistance to the bowlers, Punjab XI Kings bowlers would be able to explore it better than Chennai Super Kings' bowlers. 1. Shaun Marsh: Son of the great Australian cricketer has been in great form, right from the day he has set foot on India. So his and Sangakkara's wicket would be the most prized ones. 2. Irfan Pathan: One of the leading wicket takers of the tournament. He has the abilities to pick wickets and to contain batsmen. How Fleming and Vidyut handles him & Sreesanth would decide the match. 1. Chawla Vs Dhoni: Dhoni's secret weapon would be bowling against him. I am pretty much sure this would be a enthralling contest especially since Warne won the contest between batsman Dhoni and bowler Warne. 2. Sri Lanka Vs Sri Lanka: You can also expect the contest between Murali and his Srilankan Counterparts in Punjab XI Kings to be interesting. Favourites: It is tough to pick the favourite. But the home ground advantage surely favors the Chennai Super Kings. Another thrilling win for Chennai Super Kings. That too at the home of the strongest team in the competition (according to SONY commentators). Great going Chennai Super Kings. But rather than the win, seeing Chennai Super Kings getting their act together brought the most cheer to my heart. My only hope is that they continue this winning momentum. Strong Message: Removing Parthiv Patel, Joginder Sharma & Ntini was a master stroke since a strong message was sent to the team that continuous failures won't be tolerated. I am pretty much sure that when Parthiv Patel or Joginder or Ntini gets a chance to return back to the squad, their performances would be lot better. Bowling: Though DD's final score may not reflect that, our bowlers were bowling to a plan (Cramping the batsman by bowling at their legs - Negative Line). Though they sprayed and gave away wides, this tactic did not allow their batsmen to score sixes. Dhoni: Though a huge number of people may be surprised on seeing Dhoni receiving the Man of the Match award, I thought his innings was crucial since it held the whole innings together. Balaji: It was great to see Balaji back on the field. Though he has changed his action and has lost a few notches in his pace, he showed a few tricks on his sleeve. I am sure he could become a effective death overs bowler for Chennai Super Kings. Opening Partnership: Finally a opening partnership that fired. It was nice to see Fleming back in form. Hope to see much more vital scores from him. Umpires: I don't understand the umpires' partiality against our team. Against us, they are always in a hurry to give fours as sixes, leg byes as wides, etc... At the same time, our batsman are given LBWs when they are clearly 'Not Outs'. It is time IPL creates a mechanism where complaints against umpires could be registered after the end of the game. Fielding: As Dhoni has already pointed it out, our fielding let us down today. I still feel we are missing that crucial 'intensity' in the field. Fifth Bowler: Not only in Delhi Daredevils, our fifth bowler is our weakest link. The fifth bowler(Amarnath/Kapugedera) leaked 50 runs in their quota of four overs. Hope they get their act together. "Adversity doesn't build character...it reveals it." P.S: Except for the readers of this blog - Fansite of Chennai Super Kings, everybody else was caught by the surprise inclusion of Chamara Kapugedera in the Chennai Super Kings Team. Tomorrow is a crunch game for Chennai Super Kings. After starting the tournament strong, now they are billed by many as the weakest IPL team. And any more defeats would be shown as further proof to those statements. Even the team's fans have started doubting their team's abilities. And Dhoni faces his toughest challenge as a captain. He has never faced such a long losing streak. While Dhoni may be facing his toughest challenge as a captain of Chennai Super Kings, other players are criticized for their poor performance. Right from the coach - Kepler Wessels to the foreign players - Fleming, Ntini have not been great so far. Times may be tough for Chennai Super Kings, but that's when you show the world what you're made of. There is a great saying, "Adversity doesn't build character...it reveals it." It it time for Chennai Super Kings team to show what they are made up of. For the first time in the series, they enter tomorrow's match as underdogs and expected by one and all to lose the match. Expect at least one or two changes in the squad.. Changes I would like to see - Parthiv Patel out of playing eleven or batting lower down the order, Anirudha & Fleming opening + Palani Amarnath brought in the squad for Joginder Sharma. The strongest team on the Indian Premier League would be looking to claw back to its winning ways and clinch the top spot after its surprise defeat at the hands of Mumbai Indians. Expect their players to come back firing. Especially since they had a 3 day rest before this crucial match. YoMahesh & Sangwan: The outcome of the match will depend on how Chennai Super Kings batsmen handle these two bowlers. AB de Villiers: He has not been able to reproduce his Pro20 form so far. So we can expect him to come good for Delhi Daredevils sooner rather than later. AB de Villiers Vs Albie Morkel: Both these players have played for the same team(Titans) for so many times. So it would be great to see how they fare against each other. YoMahesh Vs Badrinath, Anirudha & Vidyut: All these players have fought many a battle for their domestic team(Tamil Nadu). So it would be enthralling to watch YoMahesh bowl against them. I expected it to be a much easier ride into the stadium today. Being a weekday, an opponent ranked at the bottom of the table and given the home team’s disappointing recent run, the rush was bound to be much lesser. I found enough time and space to buy a Chennai Super Kings flag from an old lady outside the station. When I asked for the price she blurted out some number in Tamil leaving me quite clueless. When I managed to convey this emotion to her, she had the good sense to find another customer, a young Tamil guy, to do the necessary translation. The flag cost sixty rupees, arguably a bit exorbitant, but I was not going to haggle with a poor, old lady who did not speak my language. I handed her a hundred and waited for what seemed to be an eternity as the poor soul managed a great balancing act, literally, holding several flags in one hand, and trying to carry out monetary transactions with her customers with the other the money of course stashed away in a compartment of her saree. I had a good mind to leave her with the hundred but, God bless her soul, she managed to return my change just before my patience was run out. As soon as I entered the stadium an earnest looking policeman promptly snatched the flag from my hands, and before I could comprehend what was going on, freed it off the stick that was holding it. For good measure, he disposed off the stick. Great! Once inside, I got a rude surprise in the form of a major price hike in the coffee prices – inflation is well and truly here, right in our midst In a period of four days the prices had skyrocketed by 50-67%!! Arun Lal was in the center doing the pitch report. The pitch, (and the report) I guess must have been as flat as a dodo, so to say, because clearly someone found the need to spice it up. The cheerleaders from both teams were right behind Lal practicing their moves (this really means that their leader is performing the moves and they are merely aping her). The new idea was that Lal should make a Bollywood-style entry from amidst the two teams of cheerleaders. This he duly did and appeared as comfortable as a test player in a T20 game, to avoid some old clichés about fish and water. My heart wrenched a bit when I saw Adam Gilchrist walk out for the toss because it meant that I would not be able to witness my favorite player, sorry artist, the great VVS Laxman play his masterstrokes. But Gilchrist, I must note, played the model captain. He walked out with MS for the toss (unlike our pampered and almost uncouth Indian players like Ganguly and Sehwag) and was all grace and dignity personified. It was to be Gilly’s game by all accounts. From the moment the Deccan Chargers took the field, Gilly was in control like a conductor at a well-perfected orchestra. The game was not close by a big margin but that did not mean that I did not get my rupees worth. When Badrinath tentatively poked at a delivery from Afridi that jumped up on him, Herschelle Gibbs, stationed exactly 180 degrees opposite to my vantage point, initially a bit confused by the course of the ball, just like the batsman, took a couple of steps to his left and then launched himself into orbit to pocket one of the most magnificently stunning catches ever, the best I personally have ever seen on the field. And then, later, only a trifle less spectacularly, Albie Morkel hit one from Pragyan Ojha right on the roof of the stadium again putting me in one of the best positions to witness. Incidentally, and somewhat ironically, these action moments in this speed-of-light version of cricket are the ones that allowed me plenty of time to soak it in. The Gibbs’ catch, for instance, was not, blink and you miss it stuff. The ball looped in the air, Gibbs had enough time to judge it, walk a couple of steps to his left and then put in the dive, the whole sequence lasting for almost a couple of seconds, an eternity in cricketing terms. Well, they say the World is full of contradictions. Also goes to show that even a T20 game need not rely on the close finish to be exciting. Incidentally, do some of you guys follow the Cricinfo Wagon-wheel thing when you are annoyingly stuck in the office during a big game or when Neo Sports is the only option to watch a test series and your cable operator decides to indulge in non-cooperation? Well, I saw these guys who make your life just that touch more bearable, up close today. These guys who operate the Cricinfo software, and I must say do an amazing job, considering the speed at which the game progresses and the impatience among their consumers, which I am only too well-aware of, sit alongside the official scorers, who incidentally I noticed frantically wave yellow flags upon acknowledgement of any proclamation by umpires. So now I realize why the other day Billy suddenly turned, looked at me, and nearly made me jump off my seat as he thrust his hips as though in a fit out of the blue, and jerked his arms in the air. He was actually seeking the attention of these good folks to let them know that the ball was a wide. Sigh. It can be justifiably argued that television coverage gives a better sight of the game of cricket than the one from the stands but the aspect that TV cannot give you is the sound. The sound that the bat makes when it strikes the ball can be truly appreciated only from up close. And it is this sound that distinguishes the skills of a great player from a merely good one. This distinction is particularly pronounced when the great and the good co-exist at the crease. The other night, the two roles were played by Sehwag and Gambhir, and today it was Gilchrist and Styris. It was of course, Gilchrist’s game, he was the supreme dictator. The key is that for Gilchrist even the slight mishits seem to be attractive while from a player like Styris even the shots of the meat off the bat are only okay. Usually, if you were forced to associate one word with the batting of a certain supremely skilled player, with Brian Lara, you would associate “flow” with Gilchrist it is “crisp”. Crisp was his strokeplay last night as he reduced to dust any hopes of an upset Chennai win. Finally, another word for Rohit Sharma. I guess I have put in so many words for him over the past few weeks that he should grant me rights for his biography twenty years hence. But the lad’s strokeplay sounds definitely closer to the Gilchrists of this World, than the Styrises. And with the kind of cool head he has shown, which, incidentally is now adorned by the orange cap (which is worn by the highest run scorer) he is certain to be destined for a great future. Isn’t it possible to get jaded visiting the stadium to watch a T20 game four times in two weeks? Well, the best part of this tournament is that on every occasion you have the added attraction of watching a different set of players perform. While I am supporting the home team, now, in the span of a fortnight I have had a chance to witness in addition to Dhoni, Hayden, Hussey, Murali, Fleming, Oram and Ntini, Jayasuriya, Pollock, Bravo, Harbhajan, Ganguly, Ponting, McCullum, Ishant, Sehwag, McGrath, Asif, Gambhir, Gibbs, Afridi, Rohit Sharma and now above all the great gentleman cricketer Adam Gilchrit. That can’t possibly be such a bad show. Today's game was our third defeat in a row. Bottom four teams would be looking to seize this opportunity provided by Chennai Super Kings. And Cricket Commentators have started writing our team off. What do you think the team should do to reverse this losing streak??? Another defeat... Third in a row... It is now time to hit the "PANIC" button. The team surely needs some drastic changes if it has to start winning again. It can't carry any extra baggage(like Parthiv Patel) for any more time. Our opponents have started exposing these weakness in the team. Also they have been able to execute their well laid plans while our team has found itself, lacking in preparation for the matches. Albie Morkel: Though his bowling is not as impressive as his batting, he has laid his claim for promoting himself up the batting order. Murali: He is showing that he can bamboozle batsmen in any format. He should be begging his team mates to provide a competitive total to defend or to bowl first. Gony: Gony's last over sixes should really bode well for the team. Even his bowling was pretty impressive today. Weak Top 3: For any team to succeed in the T20 format, at least one of its top three batsman should last for 10 overs. But sadly in our team, the top 3 are the weakest batsmen of the team. Hope common sense prevails and the better batsman like Raina(3), Morkel(4), Dhoni(5) & Badrinath(6) are promoted up the order. Parthiv Patel: 7 seven matches are more than enough to judge a person's ability in a batting order. It is time Parthiv Patel is thrown out of the playing eleven. If he is the best batsman available of the lot, at least ask him to bat lower down the order. Let the opening position be given to some other explosive player. Dhoni: Except for Dhoni's assault on Steyn in the match against Bangalore Royal Challengers, Dhoni has been pretty ordinary with respect to his strike rate. [His strike rate has been generally less than the team's strike bate] Even the twenty three runs he scored today were less than run-a-ball. The pressure created by his slow strike rate is one of the major reasons for the middle order wickets falling in heaps. Joginder Sharma: He calls him an all rounder. But both his bowling and batting has been pretty ordinary. Time to bring Palani Amarnath or Balaji in the place of Joginder? Badrinath: In the last two matches, Badrinath got opportunities to show his class and put up his name for the Indian team selection . But sadly, he failed both the times. Raina: He has been the best batsman of the lot. Hopefully he changes his habit of throwing his wicket away. Kepler Wessels: I don't know what he is doing. He has not been able to come out with strategies to win matches or any surprises to put the opposite team out of balance. It is time he gets innovative. 'Bat First': Three matches have shown that Dhoni's 'Bat First' philosophy has not been working for the team. [Only 10 out of 26 IPL matches has been won by teams batting first]. It is time we give 'Bowl First' option a try. Chennai Super Kings next face Delhi Daredevils at Delhi. If they did not make some drastic changes, expect another thrashing and a humiliating defeat at the hands of Delhi Daredevils. Two teams that are equally determined to win a game will meet today at M. A. Chidambaram Stadium. While one team lurks at the bottom of the table, the other side has slipped from its top position. Since both the teams rely more on their batting firepower rather than their bowling, we can expect a cracker of a contest today. Gilchrist: As Gilchrist showed in the match against Mumbai Indians, he can annihilate any attack on his day. Afridi: Though he could be as dangerous as Gilchrist on his day(which are rare), it is his bowling that worries me the most. Gilchrist Vs Ntini: In the last two matches, Ntini was bowling with a lot of heart. So expect the face-off between these quality players, who would like to change their respective team's losing streak. Though there is no official confirmation, rumours have started that Chamara Kapugedera, the talented opening batsman from Sri Lanka may join Chennai Super Kings. Swarnavahini, a leading news and entertainment channel in Sri Lanka reported this news. 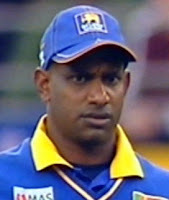 Chamara Kapugedera, a naturally aggressive right-hander, got his first taste of international cricket when he made his One Day International debut against Australia in Perth in 2006, A stylish and classical player, he is also known for his big hits. Though Chamara Kapugedera may not find a place in the playing eleven, it will be a great experience and a good income for the young batsman. Bringing him into the squad is a good thing since it makes the current four to justify their presence ahead of him. A good move especially if the future is taken into account. Hope they follow this by bringing in the talented Ajantha Mendis also into the squad. P.S: Thanks Nadun, for informing me about this.